One part of camping that is often underrated is enjoying a warm meal. While there is nothing wrong with cold beef jerky, a warm meal can give you the boost you need at the end of a tiring day of climbing, kayaking, or walking. A reliable stove helps you stay warm with a hot cup of tea in the morning, or rice and chicken in a pot in the evening. A hot meal gives better nutrition, which is important due to the physical exertion from all the weight carrying and rigorous activities you may undertake during the day. It also helps when your body temperature gets cold, which can easily happen at night if you camp during spring, autumn or winter. A camp stove is a good investment, but before you purchase one, you need to consider your plans and know what to look out for. If you drove to your camping spot and you plan on cooking close to your car, a camping stove could serve you. They are similar to home stove burners, so you can cook more complicated meals on them. If your camping group is more than four, these stoves are also appropriate because you can cook bigger meals faster on them. They are quite durable too. 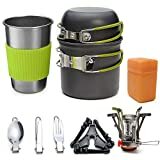 On the other hand, a backpacking stove is for you if you plan on hiking to your camping spot or you park your car more than one kilometre away from where you prepare your meals. You can still use them if you cook close to your car though. They are not as heavy as the car camping stoves and are easier to carry. 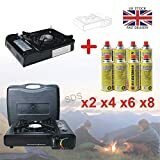 You’d also save more on fuel, but they are not as durable as the car camping stoves. Tent stoves are mainly used to stay warm, but most models have been made to cook as well. They are a great option if it’s raining or snowing outside. Note, you can only use them with fire retardant tents. There are three major fuel types you can choose from. A canister containing either propane or butane, or a mixture of both, liquid fuel, and alternative fuel sources like fuel pellets or wood. While propane is easy to use and low maintenance, they are inefficient when the canister is almost empty. They also take time to warm up if exposed to cold. In addition, they burn fast and emit carbon monoxide, which is not safe or eco-friendly. Although, in the open, there is not much risk. Liquid fuel can run during any weather and it’s more eco-friendly. Using them also cuts down your cost on fuel and they are more accessible, but they require more maintenance and one single liquid fuel bottle weighs more than one single fuel canister. Wood-burning stoves are great. You don’t have to carry the extra weight of a fuel bottle with you and it totally removes the cost of fuel from you. However, you can’t use them everywhere. A wet environment or rocky and sandy area with no available wood (except if you carry yours) will pose problems. Some camping sites have restrictions to their use too. There are also other sources of fuel, such as alcohol and solar energy. Alcohol is light and compact but harder to work with. Solar stoves are eco-friendly and they totally remove the extra cost of fuel. The only downside is that they need sunlight to operate. Nevertheless, they can help you save money on the long-term and most models retain the flavour of your food. In addition, the amount of money you are willing to spend on your camping stove should help you narrow down your choices. Durability: it should last for a long time. Portability: you should be able to lift your camping stove relatively easily if you have to. BTUs/kWh: the more BTU/kWh your camping stove has, the more power it should have. 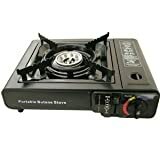 The power of the stove directs how fast the food will get cooked, however, the overall design of the burner and where the stove is placed when cooking can also affect how fast the food is cooked. Efficiency: you don’t want it going out on you at the end of a cold day when you have already dreamt of a warm dinner. Safety: it’s great if it has a safety switch which helps you avoid a fire when you mistakenly fall asleep without turning it off. A great camping stove should be safe regardless of the presence of extra features. Overview: A hyper-efficient wood burning stove that also charges your electronic devices with a USB cord. The Biolite camp stove cleanly cooks foods using burning wood as fuel. It is designed to produce a powerful flame that quickly boils water, grill burgers, roast marshmallows and handle other stove tasks efficiently. It features a portable grill attachment on the outside that can be used to grill corn while the user cooks on the stove. There is a limitation of 3.6kg for pot/food weight but this is big enough to feed 1-2 persons. With its 935g weight, it is easily portable and users can backpack with it. 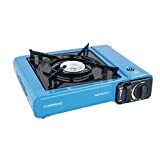 The best part of this stove is that the user can charge gadgets – mobile phones, tablets, digital cameras, led torches and other small electronics with it. It generates energy for charging through a thermo-electric generator-powered fan that feeds the fire more air while capturing energy from the flames. The stove itself is a stainless steel canister that is easy to clean. The only gripe about it is that it consumes fuel (twigs and/or wood) very quickly so you have to constantly stop cooking to refuel. It doesn’t only cook food, it can also charge gadgets. Cooking has to be interrupted in order to refuel. Overview: A functional cooking stove that is built for convenience and cooking multiple dishes at the same time. The Campingaz camping chef stove has a functional design that allows the user to cook multiple dishes at the same time. It is equipped with two powerful burners with 1.5W each and a downward radiant burner with 1.5W. You can cook two meals on the burners on top and supposedly grill a slab of meat or toast a slice of bread at the same time; the grill is not well designed so it falls short of expectations and fails to toast one slice of bread. While the grill is not so good, the top burners are most impressive. They heat up pretty quickly and cook food efficiently. Besides that, the flame is protected from the wind on one side with the metal lid that acts as a windbreak. A downside is that it only protects one side (the back of the unit) which is not great if the wind shifts. The stove is not as lightweight as some other stoves, but it’s not as heavy as some other stoves too. It clocks in at 4.1kg which should be easy to lift. 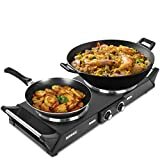 It is designed to fold flat like a briefcase when you have finished cooking, and it has handles for added convenience for storage and transportation. It is made of stainless steel and easy to clean after cooking. In addition, you have the matchless ignition with the piezo igniter. You can use butane gas (or propane if preferred) connected from your bottle via a tough hose and a regulator to keep things safe. Overview: A compact stove that offers multiple cooking options. Campingaz has been around for a long time and they are known for their stove quality, and the Campingaz party grill 200 is no exception. With this stove, you can choose between cooking with the interchangeable stove top – a cooker, grilling grid, and griddle. So cook stew or soup, grill your barbecue, and use the griddle for your pancakes and bacon, all in one day. The best part is that at the end of the day, all these elements and some other parts can fit inside the stove. The detachable stands are also a big plus. They are used on a flat surface for support and can easily be assembled/disassembled and afterwards stored within the water compartment of the grill. The total weight of all these parts is 3.4kg. Safety was also considered. It is equipped with a protective lockable lid that clicks on the top of the stove. Powerwise, it doesn’t disappoint and can boil one litre of water in just about four minutes with it’s 2000W. The water compartment doesn’t only store the stands, its primary work is to prevente grease and other oils from sticking to the stove. But sadly, the coating doesn’t last long, therefore defeating the whole ‘non-stick’ idea. Another downside is the lighter. While it comes with an automatic lighter, we advise that you take yours with you because the lighter doesn’t work 100% of the time. Hard to clean after a while. Overview: A Solidly built and stable stove that delivers heat and fuel efficiency even in wind and rain. The wind should not stop you from having a delicious meal. The MSR Windburner stove means business with its enclosed design that protects the flame and allows you to keep on cooking in rain and winds of up to 19 km/h. The MSR Windburner stove system offers fast boiling. It is also more fuel efficient than most camping stoves. In addition, it is easy to use and control; the fiddly control valve is positioned for easy access, and the internal pressure regulator and heat exchangers help users get the most out of the gas canister. You can only use MSR Windburner pots with this stove and for this particular model, it’s not so big. It should be enough to cook meals for two people at a time though. If you need a bigger size pot, you can buy any bigger MSR Windburner pot. One great part of the stove is its light weight of only 432 grams. Even when added to the 226g fuel canister, it is easily portable. The fuel canister can be connected either using the anti-topple remote design or fixed directly underneath. The stove doesn’t have a piezo igniter, but you can easily put it on with a lighter or a match. Internal pressure regulator and heat exchanger. Restriction on the type of pot a user can cook with. Overview: A compact fast cooker that is affordable and easy to clean. The Terra Hiker camping gas stove packs 3500W that generates a lot of heat to boil one litre of water in just two minutes or cook your meal in a matter of minutes; this also helps save fuel. It can be used for a group of campers because it supports utensils of up to 18l, and the integrated windscreen will keep you cooking with no wind disturbance. This stove occupies very little space and is pretty lightweight. Despite its size, it is quite sturdy due to the mixture of aluminium alloy and stainless steel in its make-up. This makes for an easy to clean stove that is resistant to corrosion and highly durable. It features an igniting knob that is easy to use but needs extra care due to its position. The heat can be adjusted with the flame adjusting knob. Another great thing this stove offers is the low gravity centre and the serrated stands that provide stable support. The stove runs on isobutane-propane but you can also use butane-propane. The ignition is too close to the flame; it could become a safety hazard. Overview: A stove that delivers good value at a great price. 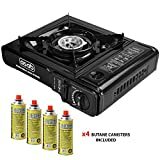 Not only does this camping stove come at a lower price than most, it is almost the best portable gas stove currently available. Liquid gas is used to power the stove which makes it highly economical. It features a piezo igniter, handy carry case, and a sturdy design with a fixed enamel pan support and hard plastic case. This makes it easy to hike or travel with it. The sturdy design is also great for users who want to cook for a group of 2-3 or place big pans on the stove. On the downside, it’s not as fast compared to other camping stoves; it takes about six minutes to boil a litre of water. However, for £10/£15, it does a lot. One part of this stove that stands out is the cartridge safety locking system that prevents the stove from being accidentally turned on. It also helps the user to correctly and safely insert cartridges. The cook time leaves a bit to be desired. Overview: A compact and lightweight stove that uses different fuel sources. The best thing about the Forfar camping stove is the versatile fueling. It makes use of any natural fuel you have at hand, including leaves, wood, twigs, solidified alcohol, and charcoal. This helps you save on the cost of fuel. In addition, it comes with a storage drawstring bag that can fit easily in a backpack with a total weight of only 350g. The user can hike, climb hills, or perform other rigorous activity and not feel the weight of the stove. This stove is made of rustproof and durable stainless steel for easy cleaning and long-lasting use. Compared to most natural fuel stoves, it has a longer burning time – 25 minutes at best – before the user has to feed it extra fuel. As long as fuel is constantly fed in, it can last for up to an hour or more. To get the best out of the stove, solidified alcohol should be used in conjunction with other fuel sources, or as the primary fuel. Although it’s sturdy, the metal arms for supporting the pot are extremely thin. While there have been no complaints from users so far, it’s advisable that you don’t place a heavy pot on it. As you keep to that, also note that very small solo pots would not work due to the large opening of the stove. Another gripe is that it needs to be cleared out frequently to get air flow around the fuel. The stove also gets very hot due to its stainless steel material so you have to be careful when carrying it and wait a while before you can pack it. Affordable and easily accessible fuel sources. Cooking needs to be interrupted in order to refuel. Overview: A tent stove that is compact and packs a lot of heat. The frontier stove works marvellously to cook meals while keeping you warm at the same time. This stove – like any other tent stove – can only be used in a fire retardant canvas or poly-cotton tent that is adapted for a flue. The stove is lightweight and can be folded up, and easily carried with the provided handle. The sturdy legs easily hold down on the ground and the flue can be disassembled into sections after use, and stored inside the stove. This is great for portability, but it’s not so light that a user can backpack with it at a whopping 10 kg. If you are with your car though, the stove is a great idea since it serves two purposes – warmth and food. It’s a little messy to clean up, but once you get that out of the way, every other thing is a breeze. One great thing about this stove is that it produces a lot of heat which is great for cooking a good British army stew. There is also enough space for two pans to be placed on top of the stove at the same time. Better heat can be gotten by removing the lid and cooking directing on the stove. In addition, the user can also buy a water heater (kettle) that can be placed to touch the flue and boil water faster. You have to be careful with bodily contact though, and also protect the tent floor with a spark arrestor to prevent stray embers from melting the floor of the tent or burning anything else. Easy to assemble/disassemble and pack up. Heats up and cooks very fast. Overview: A solar stove that retains flavours and cooks efficiently, even under low sunlight. The GoSun Grill can work with very little sunlight or preserved solar energy. It has a special thermal battery that allows users to cook even when the sun’s not shining, which is great for people in cloudy areas. The battery takes just two hours to charge and uses that power for four hours of cook time. Compared to some other solar stoves, this stove heats up quickly even in cold weather. When tested with hot dogs under a cloudless sky, it was well cooked in 10 minutes. On a low sunny day, it cooked bacon in about 30 minutes and they came out evenly cooked and tasty. Another great feature about this stove is that it is cool to touch, so no fear of heat-burn. The total weight of the stove is just 3.18kg which is a big plus because that’s all the user has no carry – no fuel can. It is convenient to lift with its carrying handles and is easy to clean with a scrubby brush. Cleaning gets even easier when a sheet of wax paper is inserted under the food. One gripe about the stove though is the kickstand. They can be tough to open because they are tightly wound up. Versatile – bake, boil, fry, etc. Can only cook very limited size of food at a time. Overview: An efficient stove that’s easy to set up. In a sunny British weather, the Fondchy grill takes about 10 minutes to cook shrimp, 15 minutes for vegetables, and about 25 minutes for some tougher meals. On a cloudy day with low sunlight, it takes a bit longer. While cooking, the user doesn’t need to flip the food to get it uniformly cooked. This stove works as a three-in-one system that can be used efficiently as a cooker, grill, and oven. The stove is cleaned with water, but cleaning takes more time than some other solar stoves. Thankfully, it weighs only about 3 kg and can cook enough for two people at a time. The two stand bars and stainless steel bracelet are very stable when set right. They also serve as an indicator for the user to adjust the angle of the reflector appropriately. One gripe to this stove is that it doesn’t retain heat for a long time after cooking. The best way out is to eat immediately after the food is cooked.